In Gods Will Be Watching, I feel bad not because of what I've done in the game, but because I feel like I'm the one at somebody else's mercy, and I have no idea what that person wants. This may well be deliberate, and if so this failure to communicate its intentions either makes Gods Will Be Watching a work of unusually cruel genius, or a work of astonishing clumsiness. Maybe even both at the same time. Either way, it's impossible to recommend to anyone but the most masochistic players. An inspired take on survival, where you get to bring your own horror. Emotional storytelling and challenging gameplay can't wholly save Gods Will Be Watching from some of its bad design choices. Thought it shares some similarities with Telltale's The Walking Dead, Deconstructeam's Gods Will Be Watching isn't the same kind of game. Instead of a heavy narrative, the game is more of a resource management sim, with the resource being the other characters. When taken like that, it's a solid puzzle game with some rough, repetitive edges. This is a unique game, presented as a traditional point-'n'-click adventure title but more focused on strategy and planning instead of puzzle solving. If you push on and don't give up, you'll be rewarded -- just expect a few heartbreaking moments first. Gods Will Be Watching strives to be meaningful. The story ruminates on how hard it is to find purpose in a world where things are often outside of our control. Many may never get a chance to appreciate that message, since the game ruins its own potential. At no point does Gods Will Be Watching make the struggle worth the effort. Gods Will Be Watching is a sci-fi thriller that's all about making the right decisions. The thing is, there are no right decisions... and that's the good news. Gods Will Be Watching is certainly a unique experience, but that doesn't make it an interesting one. It relies too much on random chance and does nothing to compensate for the frustration that will cause. Unless you enjoy punishment you might want to avoid. Gods Will Be Watching takes some tired features like pixel art and adventure-style dialogue options, and makes them feel fresh. Choices have consequence, but the mortality of those around you can't be dwelled upon as your mission is far more important. You'll question how inhumane you have to be and then, without batting an eyelid, become the efficient lunatic you never thought you would be. While the decisions feel weighty, the story is essentially disjointed and becomes confusing. Where Gods Will Be Watching is really testing, though, is in its almost impenetrable difficulty. There's a fine line between challenge and frustration, and sadly, with all of its positives, Gods Will Be Watching will leave you questioning whether its really worth it. It's beautiful, no doubt. The pixel art is wonderful, and the soundtrack is splendid. Looking at just the screenshots, I'd be reaching for my wallet. But the core game is just so tedious. By the fifth chapter, you're literally wandering through near-identical scenes of desert, and at this point I'm honestly wondering if maybe this is the point? In Gods Will Be Watching, however, its rare successes are overshadowed by an abundance of design decisions that are not only frustrating to play, but actively undermine any cohesion the story attempts to salvage. 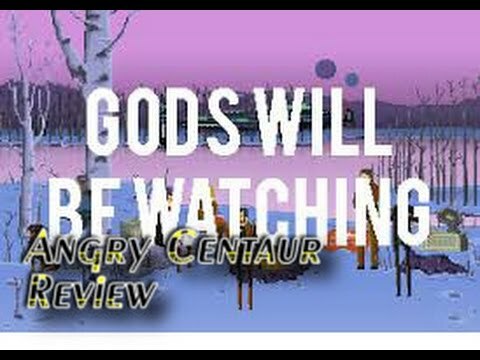 Gods Will Be Watching is an interesting and novel little game, but one that's quite horribly flawed in a number of ways. At the end of the day, Gods Will Be Watching is a title I'm sure to remember for some time for its many intense moments, but in the back of my mind, I'll always ponder what could have been if they'd fully realized their ambitions. Gods Will Be Watching shows a lot of thematic and gameplay dynamical promise, but the whole package let down by its lack of polish and consequence. If Deconstructeam made success and failure feel less arbitrary they would have had a classic game on their hands, instead the game starts to wear on you at the halfway point. I'd still recommend playing this game because it does have a lot of interesting little quirks and innovations to the genre, but you'll have to slog through some poor design choices to get to them. Despite a few hiccups here and there, Deconstructeam has weaved together a solid title that will resonate with players long after the experience is over. As long as you're willing to put in the substantial effort, of course. Nearly the whole of Gods Will Be Watching relies on your ability to act within situations, but when these situations feel so limited it's annoying to not be able to express yourself freely. This makes the game immediately frustrating as its premise, intention and art set the experience up for something incredible. But the badly designed and unnecessarily hard game design stop your actions from really 'meaning' something. Gods Will Be Watching is not necessarily frustrating in its difficult, it's that it really didn't need to be.